The US Mega Millions is one of the most popular lotteries around. It’s also the second most lucrative, next to the US Powerball. True to its name, the US Mega Millions offers huge jackpots which roll over to the next drawing until someone wins it. For the uninitiated, this means that the jackpot will keep on growing if no one wins. Intrigued yet? Read on to learn more about the US Mega Millions! The US Mega Millions is a jurisdictional lottery game that’s been around since 1996. It was first known as The Big Game, but was renamed to The Big Game Mega Millions in 2002. Of course, it would go on to be known simply as Mega Millions later on. The game takes its name from the massive, million-dollar prizes up for grabs. The US Mega Millions is officially available in 44 states, plus the US Virgin Islands and the District of Columbia. The states of Alabama, Nevada, Utah, and Mississippi aren’t included though. HUGE Minimum Jackpot: US Mega Millions offers a guaranteed minimum jackpot of $15 million at the start of each new rotation. It then grows by at least $5 million every time the jackpot rolls over to the next draw. Bi-Weekly Draws: Mega Millions drawings are held twice a week, which gives you more chances to win. Increase Your Winnings: Much like Powerball’s Power Play option, the US Mega Millions gives players the chance to increase their non-jackpot winnings for up to 5 times. How Does US Mega Millions Work? To win, you have to get at least one number match. To hit the jackpot, you have to match all six numbers. Choosing your numbers can be done either manually or randomly via a Quick Pick option. Each ticket line costs $1 each, but starting October 2017, the cost for each play increased by $1. This bumped up the fee for each line to $2. For an additional $1 per play, the optional MegaPlier (which is an additional number) can increase standard-tier prizes by 2, 3, 4 or 5 times. Plus, because the second-tier prize category guarantees a $1,000,000 prize, you can win anywhere from $2 million to $5 million if you win with the MegaPlier. Unfortunately, this option is not available in all states that run Mega Millions. As with all big stakes lotteries, matching all 6 numbers is no easy feat. In fact, the odds of you doing exactly that and winning the jackpot is 1 in 258,890,850. Meanwhile, the overall odds of winning any prize is 1 in 14.7. Not bad, if you ask me. Players can choose between being paid in annuity (over 26 annual periods) or via a lump sum. However, it must be noted that some states have different rules regarding this. The states of Georgia, New Jersey and Texas, for example, requires players to make their choice in advance. Additionally, players in Georgia and New Jersey can change an annuity ticket into cash if they win a jackpot. Texas players, on the other hand, won’t be able to change their minds. Winners typically have 180 days or a year to claim prizes – failing to do so means each of the member states gets their jackpot contribution back. Each Mega Million member state has different rules on how to handle unclaimed prizes. Much like the US Powerball, US Mega Millions jackpots carry over to the next drawing if no one wins. If this happens, the jackpot grows by at least $5 million each time. Theoretically, if no one wins for several draws, the jackpot could balloon to incredible numbers. Winning the Mega Millions jackpot may seem impossible, but many people over the years have proven that that’s not the case. The biggest winner of the Mega Millions jackpot to date are actually 3 ticket holders. On March 30, 2012, a group of friends, a retired couple, and an individual that opted to stay anonymous won the $656 million jackpot. They each took home $218.6 million. On July 8, 2016, a couple that wished to stay anonymous won the $536 million jackpot. After taxes, they took home $271 million. On January 4, 2011, two winning tickets, from Idaho and Washington, split the $380 million jackpot – then the second largest jackpot in US history. The winning numbers were 4, 8, 15, 25, 47 and 2. The odds they beat? 1 in 176,000,000! These are just some of the stories of the biggest lottery winners ever. If you want to read up on more, check out the article I wrote about the biggest lottery winners of all time. Mega Millions had a pretty great start. The first ever drawing led to a jackpot, which made the winner $28 million richer. A week later, another jackpot was won. In 2014, a total of nine Mega Millions jackpots were won. The prizes ranged from $20 million all the way up to $414 million. In 2015, meanwhile, a total of eight jackpots were won. In 2016, another eight jackpots were won. Two of the dates, July 19 and July 22, were back-to-back wins, and was the sixth time such a thing happened throughout the lottery’s history. New York seems to be the luckiest state as far as Mega Millions winnings are concerned. There have been a total of 6 jackpot wins from New York since Mega Millions relaunched in October 2013. The Bottom Line – Should You Play US Mega Millions? You could be the next US Mega Millions jackpot winner! US Mega Millions is one of the most lucrative lotteries around, next only to the US Powerball. The minimum jackpot is guaranteed at $15 million, while it can grow by at least $5 million each time it rolls over to the next draw. And, much like Powerball, you have the option to increase your winnings in non-jackpot categories by up to 5 times. The odds of winning the jackpot may be astronomical – as all jackpot odds are – but the odds of winning any prize at all isn’t that bad. 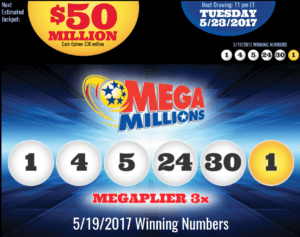 Does Mega Million have a 2nd chance option? I’ve looked everywhere and can’t see where I have this option. Hi Diane, there are no second chance draws for Mega Millions. Usually, second chance games are the state lottery’s initiative — so these tend to be for scratch-off games or state lotteries like California’s SuperLotto. Hope this helped! My name is bashar , I live in ( Amman , jordan ) , I want to ask if I can play mega lottery as international and not a citizen and what the official website to play , and is it safe to buy the ticket online ? And if I am international shall I buy the lottery ticket myself or I should buy it through a retailer ?all the retailers are safe or not? Hi Bashar, yes, you can play many lotteries online even if you don’t live in the countries where those lotteries are! It’s safe to buy lottery tickets online — just make sure you pick a trustworthy website. Not all online lottery websites are good or reliable. You can check out our lottery website reviews to find the best lottery site for your needs. Hope that helps!